Oooo, what a dark week we had: Halloween and the color black--scary, scary. 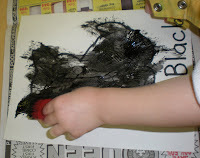 The first page of our color book was to paint a black kitten. 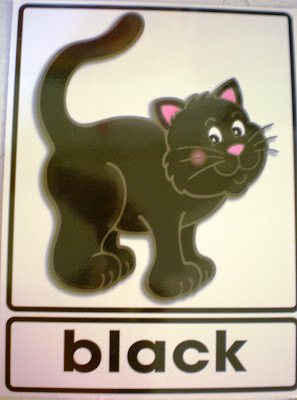 What better way to do black than with a black Halloween kitten. 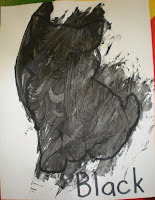 I wanted the kitten to look like it had fur, so I got some rubber basting brushes and that is what we used to paint with. This was the first time I ever did this activity. 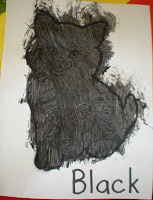 It looked better when the paint was thinner, as you could see more lines representing fur, but we are painting with preschoolers here, the more the better! The second page of the book was a bit harder. 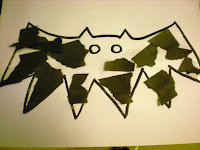 For this page we made a black bat. 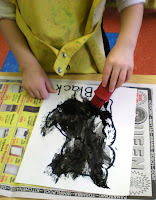 To make our bat black I give the children strips of black paper and they had to rip it into pieces and cover the bat. Ripping is very hard for them. 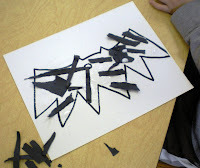 They want to PULL the paper apart and when it doesn't work they become frustrated. 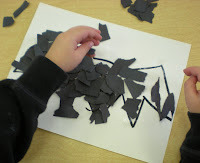 I try to help each one individually to get the hang of it and then let them try on their own. Some of them did great, some were done after a couple of tries. 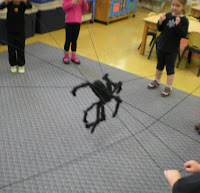 Finally, on Halloween, we made a black spider web at the end of the day and put our black spider in it. This was one of the best parts of the day. So cool! 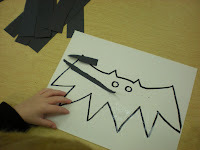 Love the bat and spider web! The spider web is an awesome idea. Thanks! and a song referance title, to boot!